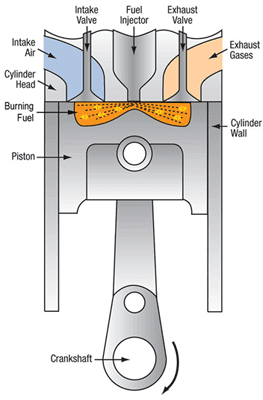 Fuelade product is a liquid substance that works to enhance the burning process in the combustion chamber and therefore is classified as a “combustion enhancer.” Researchers believe that Fuelade enhances the essential oxygen and hydroxyl radicals needed during the critical stages of the combustion cycle. These intermediate combustion particles improve combustion of the fuel, reduce soot formation, and lower the emissions of unburned hydrocarbons. There is also evidence that the product lowers the flame temperature in the engine, resulting in lower nitrogen oxide (NOx) emissions. Fuelade stays suspended in the fuel mix, bonded at the molecular level, and doesn’t settle out. This is a critical distinction from other products on the market. While the market for fuel additives generally caps out at approximately 5% savings, Fuelade has conservatively achieved 10% savings in fuel usage. This reduced fuel usage automatically shrinks your carbon footprint and improves your bottom line. Many Fuelade customers save substantially, even after factoring in the cost of the product. When coupled with other inherent environmental benefits, the Fuelade fuel-saving story becomes increasingly compelling. 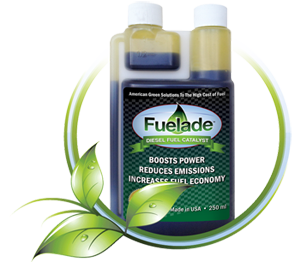 With a more efficient burn within the engine, Fuelade reduces carbon emissions released into the atmosphere. Our elemental carbon emissions reductions have exceeded 40% for a number of customers. All materials used in the Fuelade formula are considered completely safe for handling and safe for the environment. The bi-products generated during the combustion process are also considered safe from a toxicological and environmental perspective. Toxicological studies on human subjects showed no harmful effects when they were exposed to doses of the product at 100,000 times greater than the amount thought to be exiting from the exhaust of a diesel engine using Fuelade.